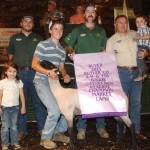 *An 11th basket sold for $1,650 to J.W. 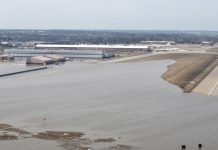 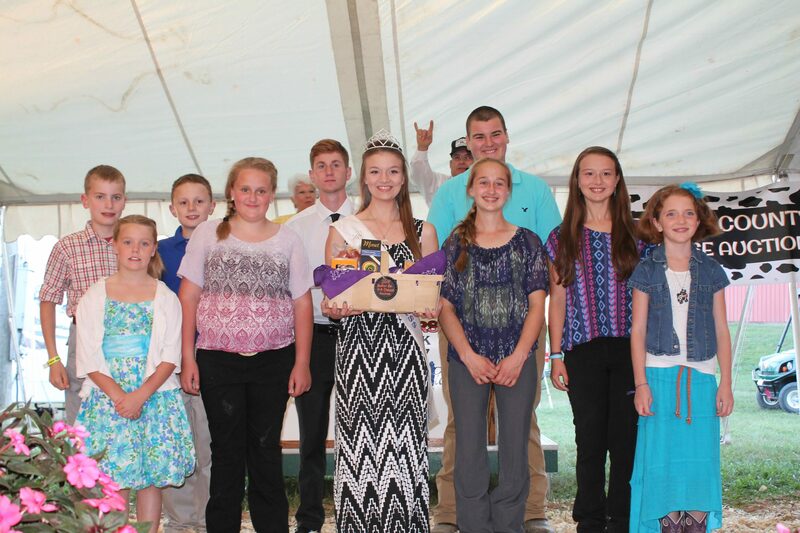 Marshall Inc. and Krill Trucking to help fund next year’s cheese sale. Because of the statewide ban on live poultry exhibits/sales, the youth raised their poultry projects at home, and showed posters of their projects in the sale ring. 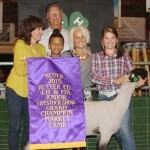 No champions were selected. 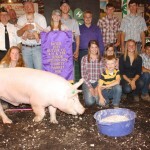 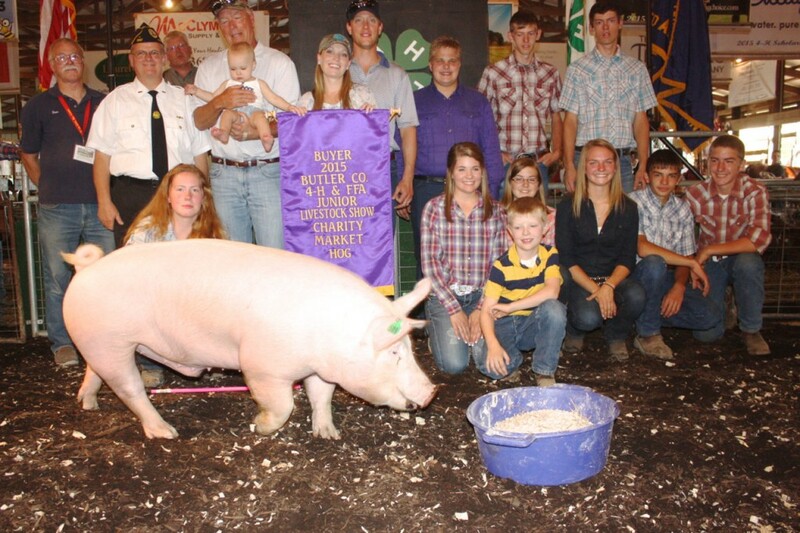 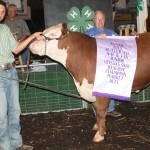 A market hog was raised by the 4-H Beef Breeding Club with the proceeds to benefit the Disabled American Veterans of Butler County. 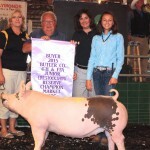 Amerikohl Mining paid $5.25 a pound for the 287-pound hog. 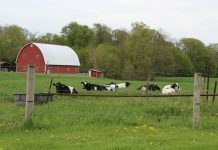 With additional donations from other individuals, the total raised for the veterans’ group was $3,056.75, and sale attendees were also encouraged to make donations in a jar on the clerk’s table. 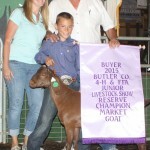 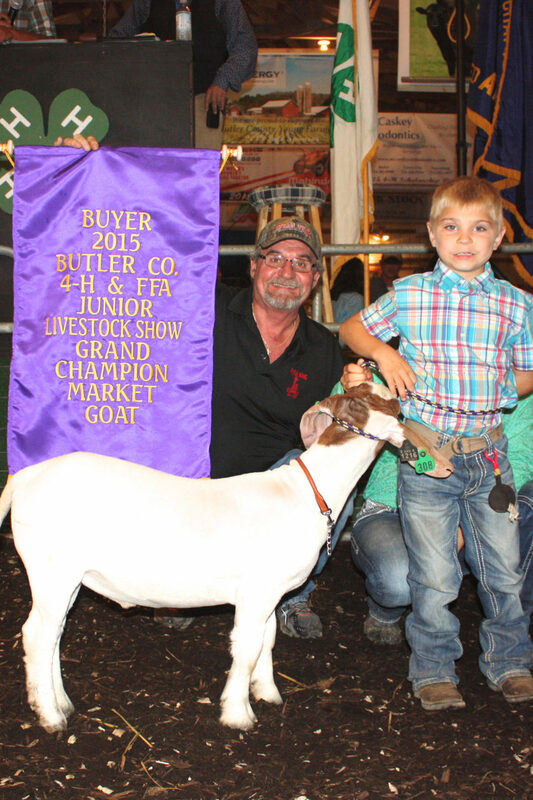 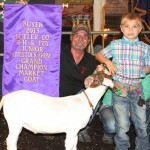 Mark Snyder’s 76-pound grand champion goat sold for $12 a pound to Rural King Farm Supply, represented by Bob Ridley. 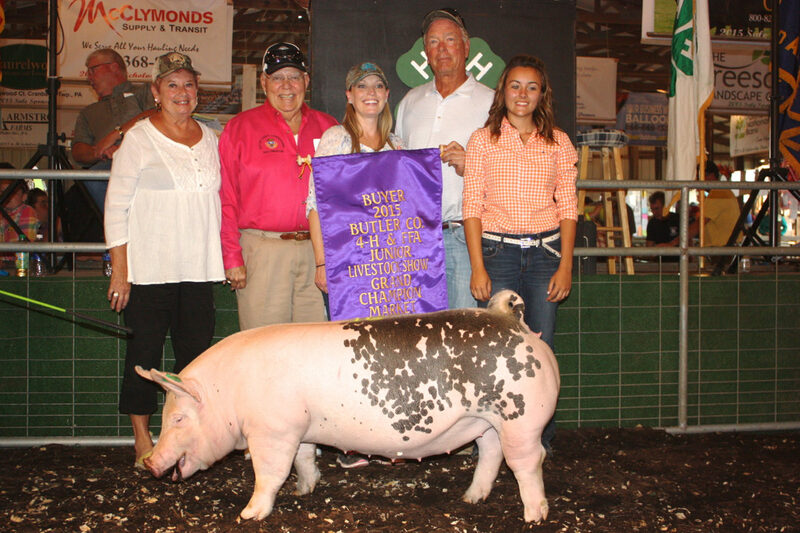 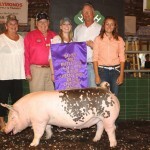 Amerikohl Mining, represented by April Stilley and John Stilley, paid $8 a pound for Courtnie Roberts’ 284-pound grand champion market hog. 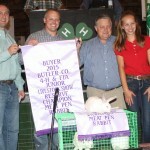 Also pictured are county commissioner Dale Pinkerton and Millie Pinkerton. 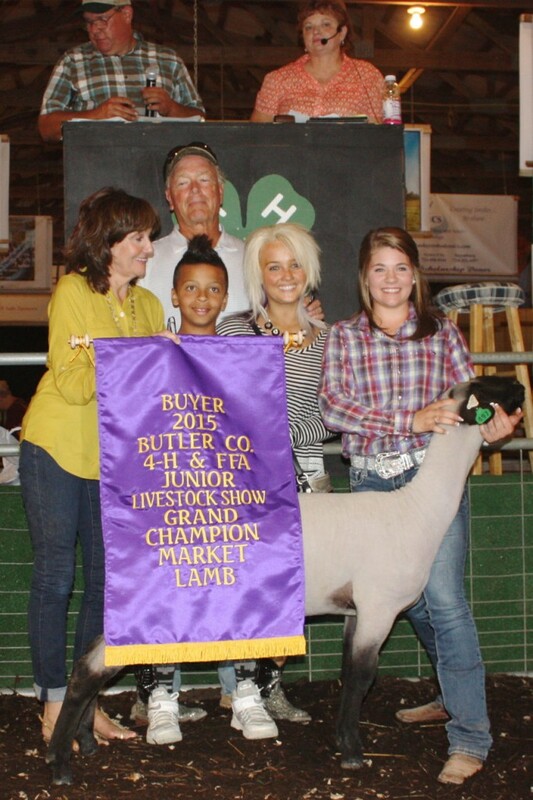 Rebecca Frazier’s 131-pound grand champion lamb sold for $16 a pound to Amerikohl Mining, represented by Denise Stilley, John Stilley, Ayden Davis and Devon Davis. 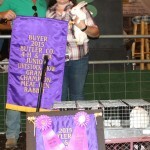 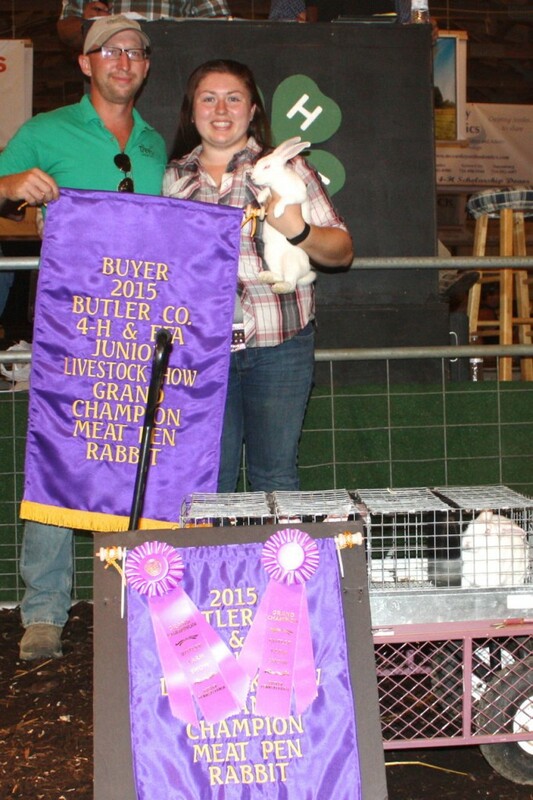 Treesdale Landscaping Company, represented by Ed Hoffman, paid a record $2,700 for Sarah Rager’s grand champion pen of rabbits. 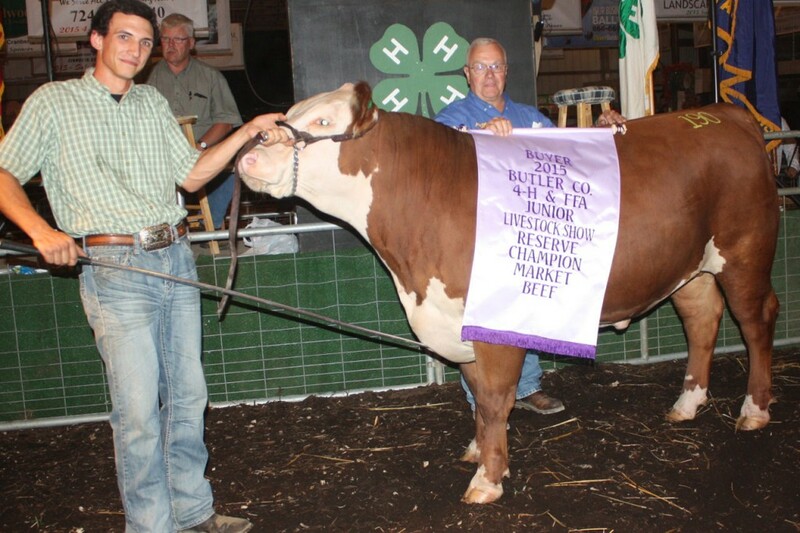 Jay Allen sold his 1,379-pound grand champion steer to PennEnergy Resources, represented by Casey Bowers and Zach Dixon, for $9 a pound. 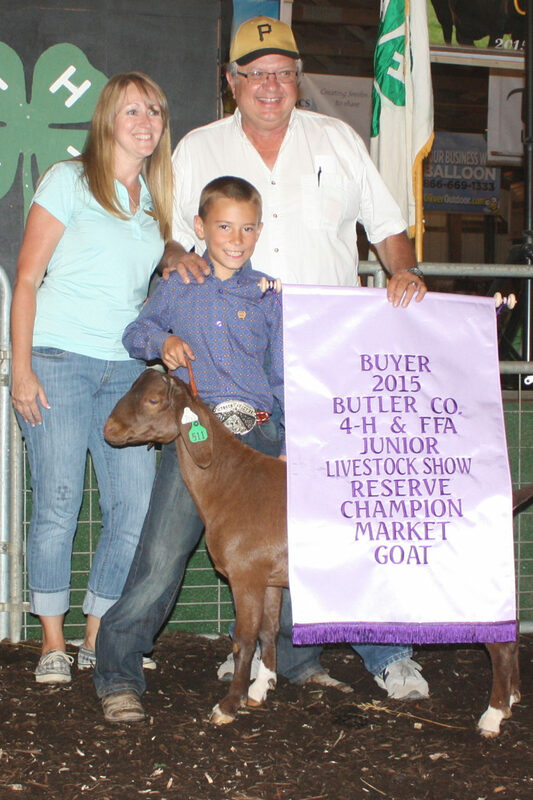 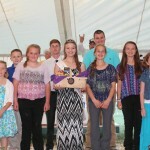 Ben Lyons raised the 93-pound reserve champion market goat, which sold for $16 a pound to Thomas Construction, represented by Amy and Doug Thomas. 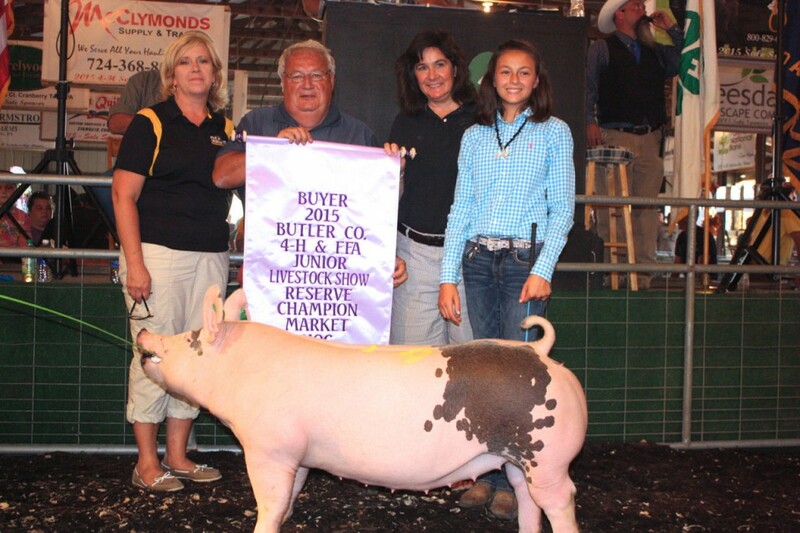 Kaiden Roberts’ 277-pound reserve champion hog sold for $5 a pound to the Butler Eagle, represented by Ron Vodenichar, who was joined by commissioner candidates Leslie Osche and Kim Geyer. 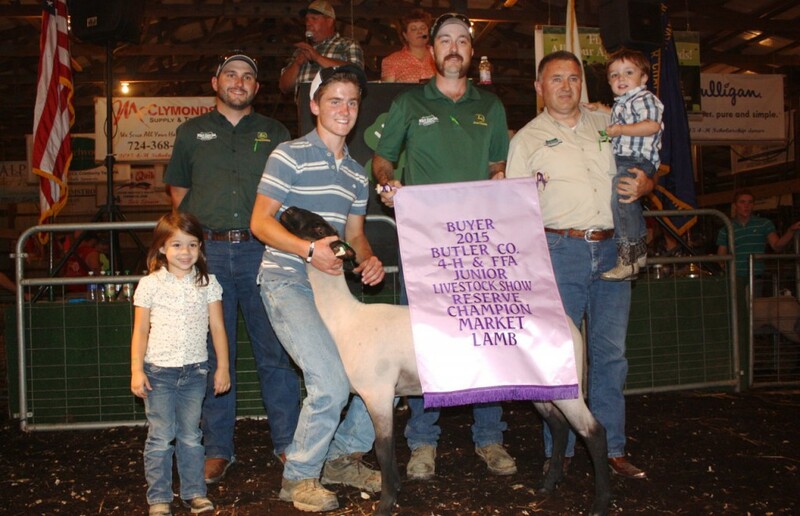 Aaron Drake’s 132-pound reserve champion lamb sold for $9 a pound to West Central Equipment, represented by Brooke Tritch, Warren Soergel, Jason Zang, and Gary Karns, holding Drew Tritch. 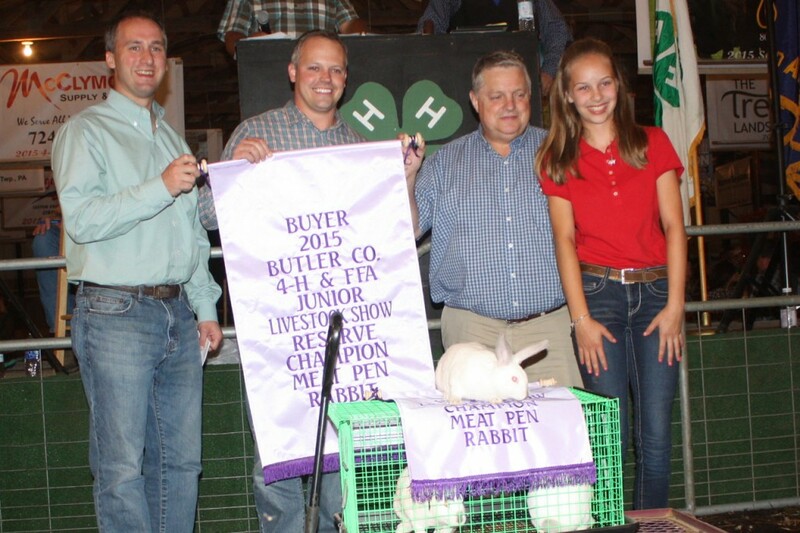 Rex Energy, represented by Mike Endler, Brad Hallam and Duane Maust, paid $500 for Grace Swope’s reserve champion pen of rabbits. 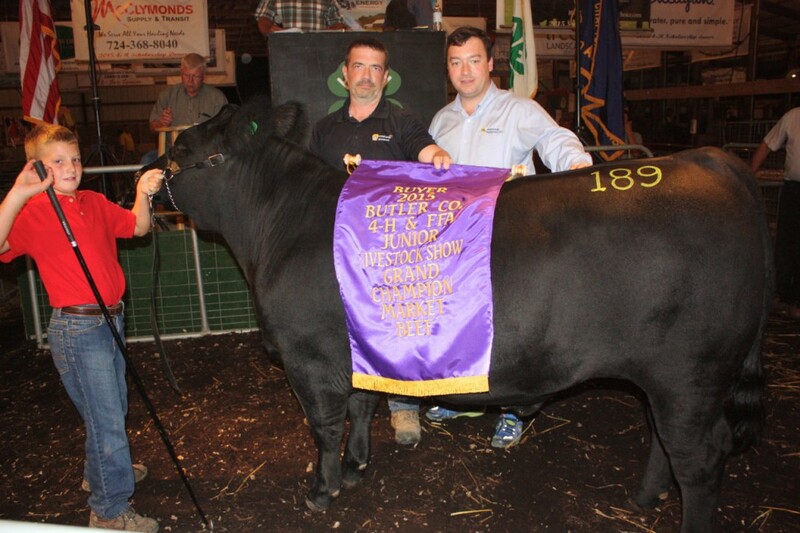 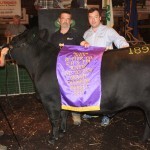 The North Washington Volunteer Fire Department, represented by Dave Hazlet, on behalf of Energy Transfer, paid $3.50 a pound for Matt Powers’ 1,305-pound reserve champion steer.